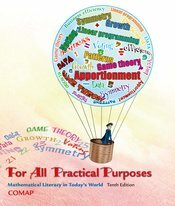 From nature, to science and industry, to economics, finance, and politics, For All Practical Purposes uses both contemporary and classic examples to help students appreciate the use of math in their everyday lives. The book offers a series of independent chapters on high-interest topics, including business management, voting, and bar codes, with relevant and interesting applications central to the unfolding of each chapter’s story. This format makes it easy for instructors to cover just the material they want to present, or even craft a custom version of the text.This edition includes new features to help liberal arts students succeed in the course. It is accompanied by an exceptional variety of instructor resources, for both experienced teachers and those new to the liberal arts math course.